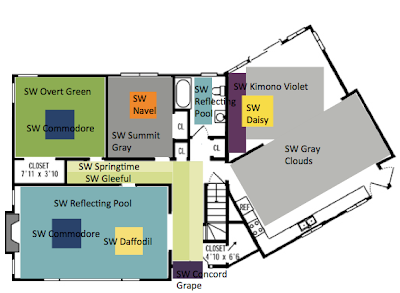 With choosing the paint colors for the first floor of the house, you know that I had already designed both the Guest Bedroom and the Craft Room. 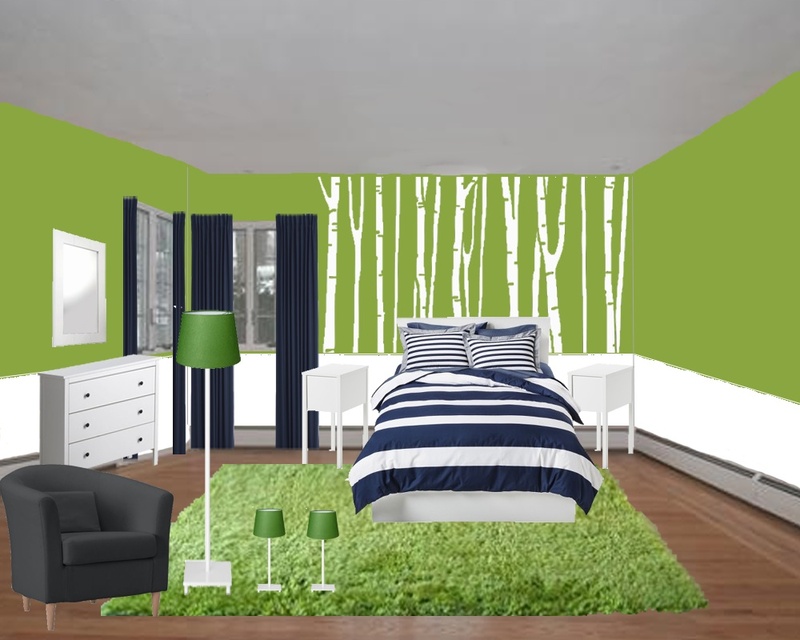 I have teased you a little showing you that the wall color will be green, and that the room was designed around a duvet cover from Target, but there are some little surprises that I have in store for you for this room, including some projects and tutorials, which will come in the near future! 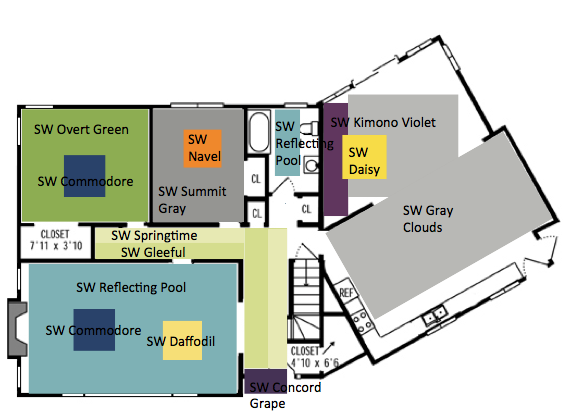 As a recap, here's the floor plan of the first floor with the colors that I have chosen for paint. And also, here's the inspiration for the room. 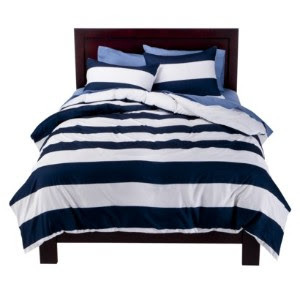 This blue and white duvet cover from Target was something I fell in love with the first time I saw it. The problem is that it has a very nautical feel to it, which is the opposite of what I am going for. I want something fresh, comfortable, modern/contemporary, and clean. So, with having already chosen the bedding, I needed to figure out what colors would help make this room look less nautical and more modern. I decided to incorporate green since it's such a fresh color and would really help to brighten up the space. Although you haven't seen a picture of this room, it has bead-board around the entire room, which goes up along the wall to about hip height. It is currently just stained dark, and actually this entire room is the only one in the whole house that still has dark trim. I'm not sure why either - seems weird to me. So, I have plans to paint the bead-board and the trim white to match the rest of the house, and then the wall above that will be painted green. Also, I have plans to add a vinyl decal to the wall above the bed, to act almost like a headboard. 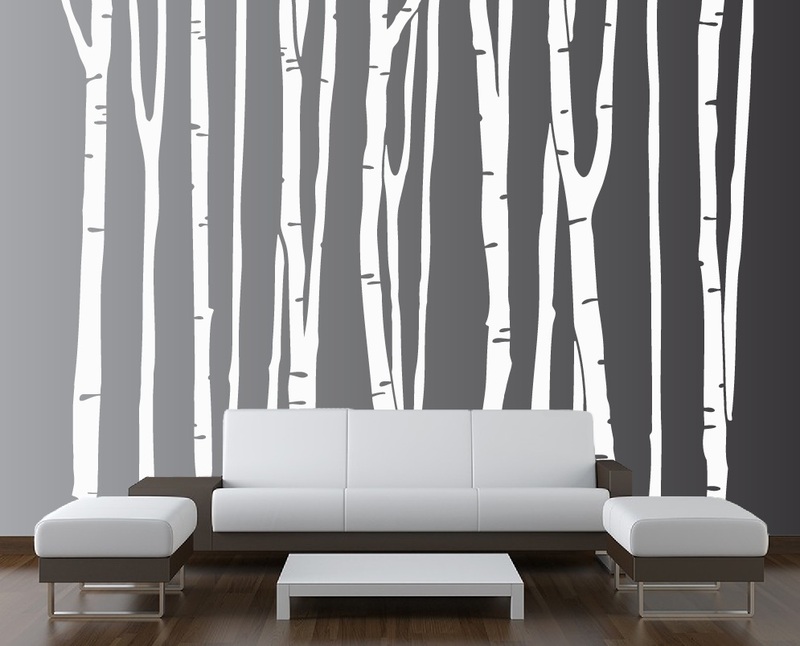 I have a slight obsession with birch trees, and love the way that they look, so when I came across this wall decal, I knew that it had to be a part of the room. The decal comes in a bunch of different colors, but I think that against the green paint, that it will really pop if it's in white. 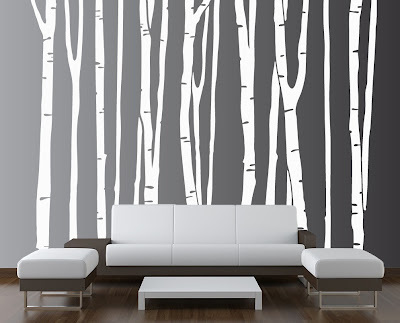 Plus, it makes it look a little more like real birch trees, which I love so much! We recently purchased a bureau from IKEA to match our bedroom set, so our old one, which is actually mine from when I was growing up, will be going in this room. It's going to be a project though, since it needs refinishing, new knobs, and I'm hoping to remove some of the traditional wood details from it to make it more modern looking. In addition, since this will be a guest bedroom, I thought it may actually be practical to have a little reading nook in the room in case our guests want a place to relax on their own. I haven't mentioned it on the blog yet, but my grandmother passed away in February. She was 89 years old, and lived a very long and difficult life, but more than anything, she loved her family. She outlived everyone, and the only remaining person in her family is my mom, and of course my sister and I. She had this chair that has been with her for over 20 years, and no matter where she lived, she had to have that chair in her living room, and it was the only thing she sat in, even when she had a couch! When she passed, my mom wanted us each to have a piece of her. While we got to choose some little things that would remind us of her, my mom offered me the chair, knowing that I had been looking for one at a few Salvation Army furniture stores. I gladly took the chair, and am so happy that I will have a piece of my grandmother in my home. Since it is currently maroon and pink with stripes, I have plans to recover the chair in navy blue fabric, but I'm not sure if I'm going to be adventurous enough to try a pattern. And with the incorporation of that chair, the room I think will look perfect. The picture below is a rough plan of how the room will look, but, the chair in the picture below looks nothing like the one from my grandmother. Do you think I could get away with a pattern on the chair? What would you do on the wall on the right? I'm kind of lost as to what to put on it. I don't want to take away from the decal, but I don't want it bare either.